Peepo! Peek through the holes. Can you see all the things that baby sees? Follow a baby through the day as it watches all the rituals of family life. Mummy makes porridge. Grandma hangs out washing. What will happen next? Peep through the holes for a clue! 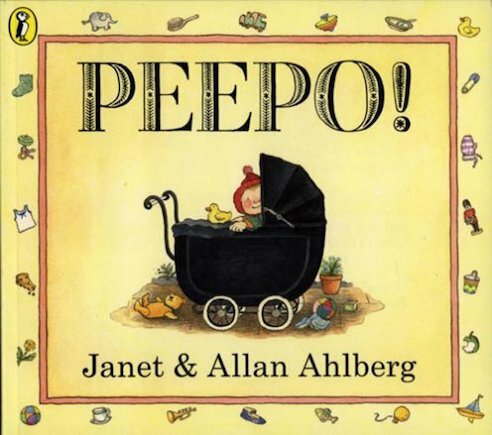 From much-loved duo Janet and Allan Ahlberg, this timeless classic brims with warm images of daily life. such a cute and amazing book I loved it and I’ve read it hundreds of times!Awesome! Lovely board book to read to my 9 month old. this book is very nice for little kids, or even for bigger kids. i remember reading this book to my little sister when she was 3! and i was six! i remember i got stuck on som words but i was only six. and my little sister really understood it.